Olajumoke the bread seller turned model goes back to School - BlogIT with OLIVIA!!! 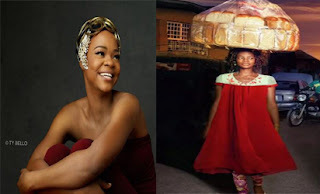 Bread seller-turned model, Olajumoke Orisaguna has headed back to the classroom. The lovely mother of two whose picture went viral when she stumbled on TY Bello’s set in February this year has reportedly started a programme with Poise Nigeria, a Nigerian etiquette and finishing school run by Mavis Isibor.Jumoke is said to be taking courses at the up-scale Lekki campus in English Grammar and Communication, and also in Total Personality Development.